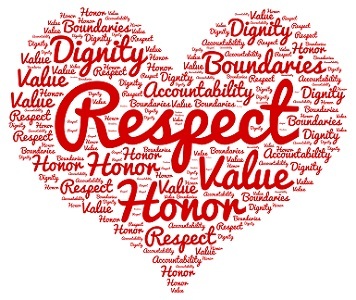 Is respect one of your family’s top moral values? Treating each other with respect is a fundamental quality of healthy relationships. When your children treat you with respect, they honor your worth, dignity and importance. Likewise when you treat your children with respect, you honor their worth, dignity and importance. Both you and your kids want to feel valued and have your needs taken into consideration. When this happens, everyone feels respected. What does respect look like to you? When your children are treating you with respect, what are they doing? What do your kids do that you consider disrespectful? How do you feel when your kids are being disrespectful? Disrespectful behavior tends to trigger strong emotions so it quickly catches your attention.